In the best of circumstances, politics is not for the faint of heart. But in New Zealand, where a general election is planned for September 20, an ugly defamation war is taking place that would make Vladimir Putin blush. Prime Minister John Key and his conservative National Party are gunning for a third consecutive parliamentary majority, apparently by any means necessary – including a smear campaign against my client, Kim Dotcom. Interestingly, Key has developed a personal relationship with Cameron Slater of “Whale Oil,” a controversial blogger known most recently for insulting a grieving Maori family with a racial slur. Last month, Key openly acknowledged that he holds regular private conversations with Slater. It was a surprising development. Why would Key associate with such a figure, and what is the nature of their relationship? It is not known what the arrangement may or may not exist between Key and/or National Party and Slater’s website, but there are numerous credible rumors surrounding Whale Oil’s pay-for-play policy, where ad nauseum attacks are available to the highest bidder. Kim Dotcom is hardly the first victim, and John Key appears the most natural one to benefit. Slater’s obsession with Dotcom and the Internet Party seems mysteriously disproportionate. He’s published more than 100 attack posts since mid-February, giving Kim more attention than any other single political leader, perhaps indicating the dutiful performance of a tedious job, or a genuine recognition of how much Dotcom is seen as a threat by National. Having worked on political disputes in a variety of countries, I’ve seen my fair share of black media and negative campaigning. You know it when you see it. But the way John Key has chosen to operate via Slater particularly reminds me of tactics used in Russia, where ugly propaganda wars between oligarchic clans are known to get very rough. It’s that Moscow-style dialectic, where the accuser paints their victim with the very conduct that they themselves practice, seeking an overall diminishment of the topic by relativism. The corrupt dictator cooks up fake corruption cases against the opposition leader, the cheating husband accuses his wife of infidelity, and morally reprehensible authority launches an ethics investigation against his or her enemy. Every country has a defamation specialist like Slater. The United States, in fact, is cursed with dozens of them, while in Rwanda, they’ve been charged with crimes against humanity. The hate speech, the incitement, and ceaselessly offensive content is effective in attracting attention, while readers seem to care very little about the bankruptcy of facts. Thus far, National’s dirty war against Kim Dotcom has involved accusing him of being a ‘Nazi,’ churning out supposed ‘leaks’ which don’t amount to any significance, and posting recordings of Kim promising to defend his family. The blog has featured a suspiciously detailed record of who visits the mansion – sometimes releasing information that could only be known by a very limited number of people. As Key admits, he is sometimes given private, exclusive reports of who meets with Kim from Slater (or maybe it is the other way around). Considering all the lies, half truths, and misinformation, the defamation campaign may end up having the opposite effect. Think about it: after months of unrelenting attacks and with a team of people watching Kim’s every move, the very worst that they could come up with is that he owns diverse historical artifacts and that a former employee is unhappy? Seems like a desperate stretch to me. Anyone who knows Kim will tell you that the Nazi slur is laughably absurd – all the more so coming from someone like Slater, who has his own track record of racist statements which are a matter of concern. Kim has already proven the quality of his character. This is a man who’s had his life destroyed by the world’s most powerful government, accused of non-existent crimes he did not commit, and had to go through the ordeal of watching New Zealand authorities point guns at his pregnant wife and family and throw him in jail without even a single hearing to defend himself. The fact that he has made such a graceful and determined comeback despite the circumstances hanging over his head is an inspiration. Keep in mind the timing of this onslaught – why now, when Kim has decided to start a party, do they try to manufacture scandal out of nothing? 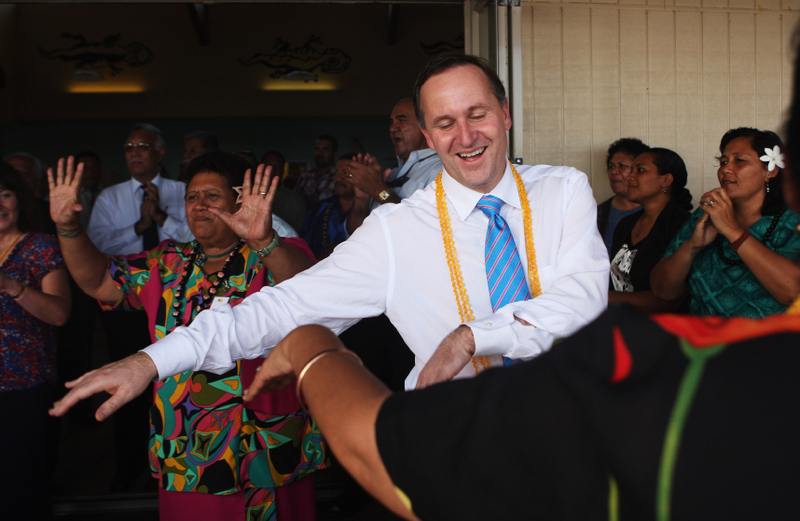 What, exactly, is John Key so scared of? The National media machine has repeatedly tried to dismiss the Internet Party as a joke, but at the same time, they are putting all their muscle into attacking Kim. In the end, these sources of these dirty tactics are irrelevant, but the bad intentions of his sponsors are what can cause damage to the country. New Zealand has experienced a diminishing level of voter participation in the last three elections. People feel increasingly disconnected and disrespected by the current political leadership. Kim Dotcom not only has the potential to activate younger voters, he also has valuable ideas and expertise to revolutionize New Zealand’s digital economy and bring better paying jobs to Kiwis. His story has exposed the worst of the John Key government and initiated a serious debate on privacy and Internet freedom in New Zealand and beyond. Key apparently has no new ideas and nothing to say in response to these important issues, so instead what we have are made up stories about Nazis and exaggerated drama of Kim’s personal life. The result is that New Zealanders are being deprived of a serious political debate that may advance public understanding and participation in the process. That, indeed, is a great pity.